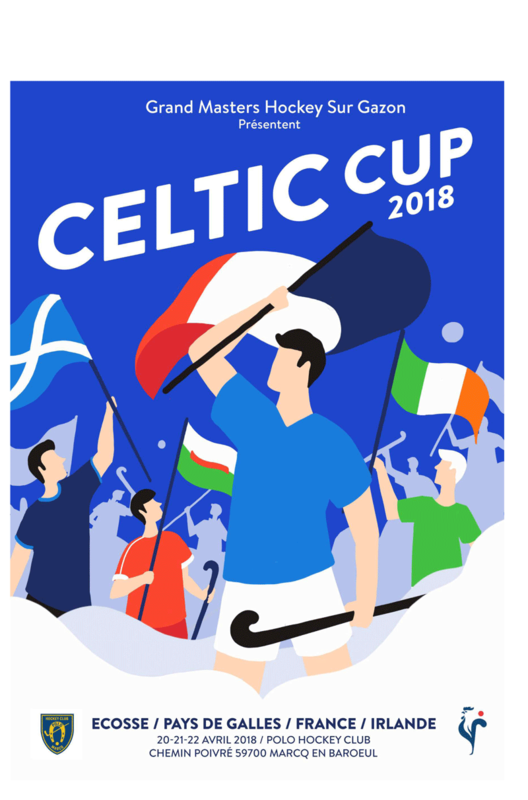 The Celtic Cup on 20-22 April took place on the new astroturf pitch at Polo Hockey Club 200 Chemin Poivré, 59700 Marcq-en-Barœul, France. Scotland Grand Masters (Over 60) and Great Grand Masters (Over 65) competed in round robins against France, Ireland and Wales for the respective trophies, while Scotland and Wales joined battle in the Senior Grand Masters (Over 70) competition. Scotland won the Senior Grand Masters tournament, took second place behind Wales in the Great Grand Masters event, and finished third behind Ireland and Wales in the Grand Masters Celtic Cup. All three teams emerged undefeated after the first match day, Over 60s and Over 70s drawing 0-0 against Ireland and Wales respectively, while the highlight of the day was a 2-0 victory for Scotland Great Grand Masters over Ireland. The Senior Grand Masters result meant that Scotland retained the SGM trophy though Wales would be keen to avenge the result in the friendly return match on Saturday 21 April. On the second day of the tournament, Scotland chalked up two wins and a draw, the Grand Masters running in seven against France without reply and the Senior Grand Masters beating Wales 2-1. Scotland Great Grand Masters were held to a 0-0 draw by France. With the Senior Grand Masters tournament finished in Scotland's favour, both Grand Masters and Great Grand Masters needed to beat Wales in their final matches to have a hope of claiming the respective trophies. Wales proved too strong for both Scottish sides on Sunday 22 April, both Grand Masters and Great Grand Masters trophies going to Wales after wins against Scotland by 1-0 (Over 60) and 2-0 (Over 65) on the final day. All matches were played in four quarters of fifteen minutes with a ten minute break at half time and an interval of two minutes between quarters.